Look at this amazing picture..
Who didn`t wish it was them.. I totally wanna be this girl.. I want that awesome dress. And I so wanna learn to shout with a bow and arrow. The dress can be bought HERE. And I need to save money.. No idea when I would be able to use it. Do you know of any goods shop? for clothes like this. 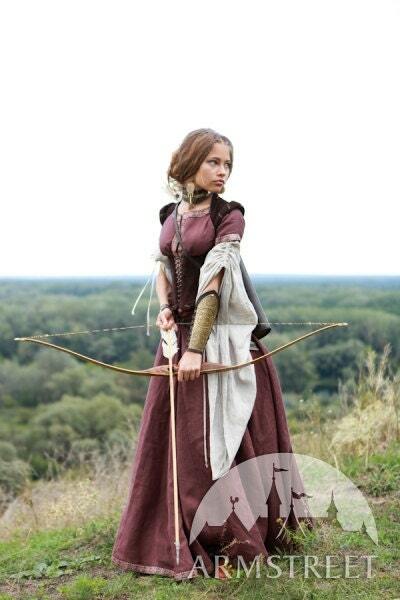 For the bow.. Well I haven`t found the perfect one yet.. Thinking of just buy a cheap set to start of with. Do you think it`s possible?? Can you shot with a bow and arrow? Is it difficult?? I bought one last summer. It felt so right, and I realized Ive wanted one all my life! Later discovered theres a field for shooting, with blinks ten minutes away w a car! My friend got inspired and got one too. Oh my gosh this is so gorgeous! Thanks for sharing!